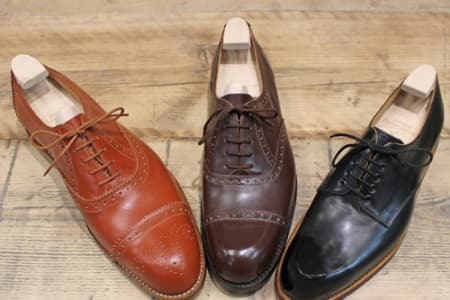 Carreducker are master handsewn shoemakers based in historic Clerkenwell, London who learned their craft the traditional way, as shoe making apprentices. 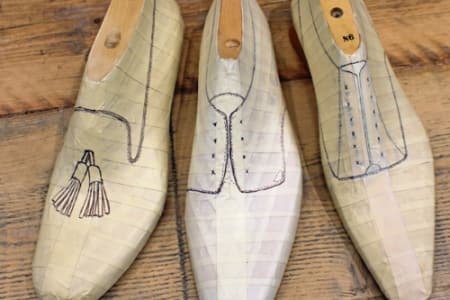 Today, they make bespoke shoes for private customers and deliver the bespoke shoe service at Gieves & Hawkes on Savile Row and at James Purdey & Son in Mayfair, London. Passionate for the heritage, handsewn craft and keen to share their skills, Carreducker have been teaching shoe making since 2006. James Ducker originally taught shoe making at Cordwainers College and Deborah Carre was a visiting lecturer in shoe and accessory design at the London College of Fashion, so teaching has always been important to them. Since they started teaching, the number and variety of courses has grown from one three-week course to a year-round syllabus of evening, short and longer classes and courses taught by industry experts. 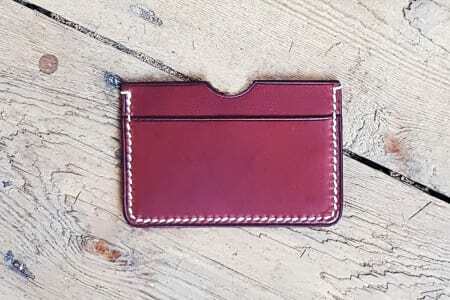 All subjects have handsewn shoemaking and craft at their heart from footwear pattern making, shoe care & polishing, 1-to-1 tuition and shoe making masterclasses to small leather accessory saddle stitch classes. Their 12-Day intensive shoe making course is the longest running and one-of-a-kind. 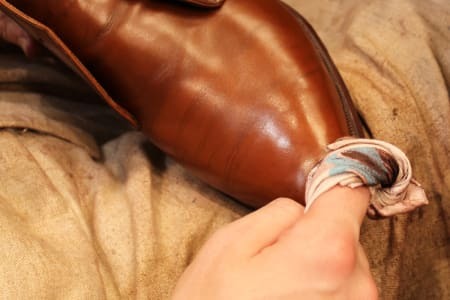 In just 12 days students are guided through the 200 plus steps of hand sewing a pair of shoes; starting with a rough pack of leather, a pair of shoe uppers and a pair of lasts (the blocks the shoes are made on) and finishing up with a pair of handsewn shoes they have made themselves. Courses are taught at the Carreducker Shoe & Leather School on the Islington, Shoreditch, Hoxton borders housed appropriately in a converted factory with metal Crittal windows and exposed brickwork hinting at the buildings heritage. 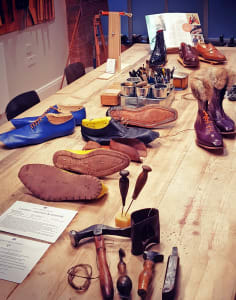 It is a warm, friendly and relaxed space to work in - with shoe and leather work tools hung along a long peg wall in the main work space, next to the bespoke work table and leather hides hung from the rafters in the neighbouring work room - making for a creative and inspiring space in which to learn. I loved the evening I spent with Carreducker trying to master hand-stitching a leather key-fob. Although I certainly failed to master it, I came away with a creation that I was proud of and thoroughly enjoyed the course. It's wet my appetite to learn more and wouldn't hesitate to return to do another. Fun, light-hearted and skilled; the team at CD made me feel at ease and very welcome. Amazing immersive experience! Lovely workshop, friendly welcome from Deborah and her talented teacher and tasty supper too. A key fob is a small thing so who would have guessed just how many techniques go into making a beautiful small leather masterpiece? Thumping holes into the leather was great for stress relief at the end of a working day and the sense of achievement at the end was so good. I organized this as a treat for my team - they all loved it and one signed up form the shoe making course immediately afterwards. So a huge success and highly, highly recommended. A throughly enjoyable experience. The school is conveniently located, close to Old Street underground station, and easy to find. After a warm welcome I met the other students, a really nice bunch, and found a seat at the spacious work table. 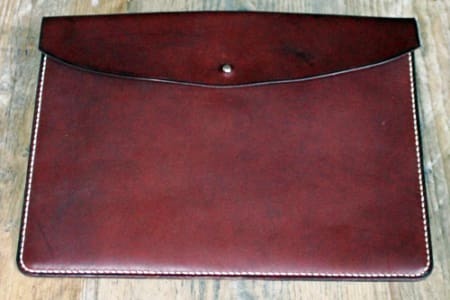 The instructor was very experienced and patient and I simply could not believe that I was able to create such a cool leather piece on my first attempt - I am an artist but do not consider myself "handy" at all, so this came as a pleasant surprise and shows just how well thought-through the course is. Highly recommended! 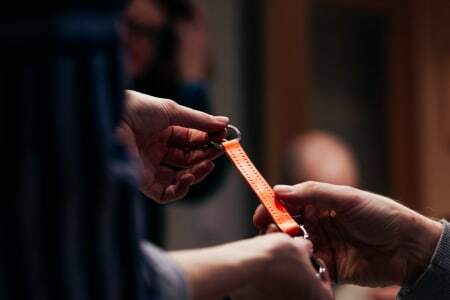 I attended Carreducker's Valentines day key fob class with my partner and would highly recommend it. We had an excellent evening learning the techniques and processes for making our own key fob which we could then take home. The venue was modern and clean. Frankey our teacher was knowledgable, friendly and patient. The class was well organised with all the tools ready laid out in preparation for us before our arrival. The class was taken at a relaxed pace and we weren't made to feel rushed at any stage, even though we weren't as fast as we could have been. Since it was Valentines day, they really did go over and beyond what we expected - laying out chocolates, strawberries and prosecco for us to enjoy to make the experience that little bit more special. It was very thoughtful and a nice touch! Thank you to the team at Carreducker for an amazing evening! We learnt how to renovate, moisturise and feed leather shoes, followed by a complete mirror shine finish. Teachers Deborah & James are super friendly and relaxed, the atmosphere is all the more enhanced by the group and a jovial drink. The venue is great and easily accessible (Central London). It's a nice way to do something a little different, meeting new people and of course useful if you are interested in shoes and want to make sure you are looking after yours well. I highly recommend it! Polishing our shoes is something we all notionally know how to do, but Deborah and James over the course of a couple of hours and accompanied by a good glass of Scotch show you that it's something to savour, to take delight in doing well, and start to understand that the very act of doing it builds a sense of content that strips away the underlying stress in life just as the polish removes dirt, wear, and tear from your shoes. I waI was presented with the course as a Christmas gift and looked forward to the challenge of lasting a pair of formal shoes. The day was full-on, introduction, practice, execution and then trial fitting. Finally, we completed the lasted upper for onward finesse by a competent shoemaker! Carre Ducker hosted my session brilliantly, I felt completely at home and my ( limited) talent respected. I had a great day and would thoroughly recommend it to anyone wanting a ‘different’ experience with a superb outcome - a pair of handmade shoes to your choice. Good value and good fun. Carre Ducker have been a delight to deal with and supportive in other ‘shoe’- related queries. Thanks, both.